Ukrainian GM Anton Korobov has taken the sole lead in the European Individual Championship in Jerusalem, Israel. He has 4 points out of 4, while a group of 8 players, each of them a GM, are half-a-point behind. However, as there are 7 more rounds to go, it would make no sense to make any conclusions and predictions right now. Instead, we would like to present the short comments by the top participants, and to analyse the most impressive games of the first four rounds. The quotations used in the article have been taken from the video interview conducted on-the-spot by Aleksander Nesterovsky. As the most part of the video, including the interview with Navara, is in Russian, we are providing some fragments translated into English. By coincidence, the interviewed players have also been the co-authors of the most spectacular games of the start. 'I don't have to qualify for the World Cup since I have the right to play there thanks to my rating, so I'm just competing for the title of the European Champion. I would be pleased to play in the Grand Prix - but I don't have the right to, unlike in the World Cup... There are many defects in the World Champiohship cycle, the 'organizers' wild-card' rule, in the Grand Prix and even in the Candidates tournament, being probably the main one. It is against the spirit of sport. Although, maybe, in current circumstances it's impossible to correct because finding good organizers might be difficult otherwise'. 1.d4 Nf6 2.c4 e6 3.Nf3 d5 4.Nc3 Bb4 5.cxd5 exd5 6.Bg5 Nbd7 7.Qc2 c5 8.g3!? 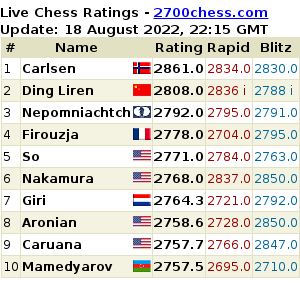 This rare line seems to have become a surprise for the Belarusian GM, even though Aleksandrov has been true to the Ragozin Defence throughout his life. As a result, the favorite scored a quick and convincing victory. 8...h6 (this move took Black half an hour, according to the broadcast) 9.Bf4 Qa5?! 10.Bg2 Ne4 11.Rc1 Qxa2 12.Nd2 Bxc3 13.bxc3 Qxc2 14.Rxc2 Nxd2 15.Kxd2 Nb6. 15...cxd4 16.cxd4 Nb6 17.Rc7 0-0 18.Ra1 leaves Black tied down, which, together with White's bishops pair, outweighs Black's extra pawn. 16.dxc5 Nc4+ 17.Kd3 Bf5+ 18.e4 Bh7 19.Kd4! Na5 20.Kxd5! A weird position. Despite the unusually advanced king, White is already close to winning: the d6-bishop supported by the pawn will provide a reliable cover. 6...h5! A fresh and very interesting idea in a well-studied position. Usually Black prefer 6...Na5 7.Qc3 c5, or 6...d5. Just for the record, the move by the rook pawn is, surprisingly, within Stockfish's first 3 lines. 7.e4 (the safer, positional approach - 7.h3!? or 7.h4!? should be studied) 7...h4 (if one said 'A' one should say 'B') 8.Qa4?! The most ambitious way is 8.gxh4 where Black has a compensation for the pawn. 8...Bb7 9.d5 hxg3! (the point of Black's play) 10.dxc6 Bxc6 11.Qc2 gxf2+ 12.Ke2. If 12.Kxf2 then 12...Ng4+ 13.Ke1 f5! with a very strong, probably even crushing attack. 12...Nh5?! A slowdown. The machine prefers 12...Bc5!, for example: 13.Bg2 Rh5! (stopping 14.Ne5) 14.Kf1 Qe7 and 0-0-0, or 13.Ne5 Rh4! 14.Nxc6 dxc6. Probably it overesimates Black's attack, but the compensation seems more than sufficient, even though the position remains extremely complex and atypical so that it's easy for each side to blunder. 13.Nb3 Ng3+ 14.hxg3 Rxh1 15.Kxf2 Rxf1+!? An interesting, purely positional sacrifice, reminding of the old Byrne - Fischer encounter. The alternative is 15...Qf6 16.Bg2 Rh8 17.Bf4 0-0-0! 18.Rd1 (18.Bg5 Qg6 19.Bxd8 Bxe4 20.Qd2 Bxf3 21.Bxf3 Kxd8 is in Black's favour) with unclear play. 16.Kxf1 Qf6 17.Nbd4 Bb7. There are no mating threats but the light squares are extremely weak in the long term, so White decides to liquidate into a slightly worse ending. 18.e5 Qe7 19.Bg5 f6 20.exf6 gxf6 21.Qg6+ Qf7 22.Qxf6 Qxf6 23.Bxf6 c5 24.Nxe6 dxe6 25.Ne5. Despite all the efforts by Black, it's still a draw. The easiest way is 59.Ne2 with Kd2-c1-b2 next. 59.Nd1?! (a bad square for the knight) 59...Kb5 60.Nb2 Bxa2 61.Kd2 Kc5 62.Kc2 Kd4 63.Nd1? The only move was 63.Na4! b5 64.Nb6 Be6 65.Na8 Bf7 66.Nc7 Kc4 67.Kb2, and Black can neither catch the knight nor push the pawn forward. 63...Be6 64.Nf2 Ke3! 65.Nd1+ (no other squares are available) 65...Ke2 66.Nb2 b5! The cage for the knight has been built, and Black is winning. 67.Nd1 Bf5+ 68.Kc1 Kd3 69.Nf2+ Kc3 70.Nd1+ Kb3 71.Ne3 Be4 72.Nd1 Ka2 73.Nb2 b3 74.Nd1 Ka1. White regisned due to the coming zugzwang. 0-1. As well as Vitiugov and Navara, Pavel Eljanov (Ukraine, 2727) has come to Jerusalem just to fight for the championship. His start wasn't as successful as his compatriot's in the lead, although 3 points out of 4 isn't a bad beginning. However, it could have been worse, since Pavel was on the verge of losing in the first round. 20...f6?! 21.Nxf6+! gxf6? Probably Pavel missed White's idea. 21...Bxf6 22.exf6 Qxf4 23.Rxf4 gxf6 was the must. The endgame is around equal. 22.Rg3+ Kh8 23.Rg7! Now 23...Kxg7 24.exf6+ loses the queen, while 23...Qxe5 24.Qh6 Qe4 25.Nf5 leads to mate. 23...fxe5 24.Qh6 Rxf1+ 25.Kxf1 Bb5+. 26.Kg1? After a brilliant combination, White allows the opponent to escape by a series of only moves. 26.Ke1! wins due to the following lines: 26...Bd3 27.Nxe6 Qd6 28.Rxh7+ Bxh7 29.Qg7#, or 26...Bh4+ 27.Qxh4 Qxg7 28.Qxd8+ Qg8 29.Qxg8+ Kxg8 30.Nxb5 axb5 31.Ke2. 26...Bd3 27.Nxe6 Qb6+ (this check makes all the difference) 28.Kh1 Bf8! 29.Qf6 Qxe6 30.Rg8+ Kxg8 31.Qxe6+ Kg7 32.Qxe5+ Kf7 33.Qc7+ Be7 34.Qxb7 Rd6. 10.cxd5 exd5 11.e6 fxe6 12.Bxg6! hxg6 13.Qxg6+ Kh8 14.Qh6+ Kg8 15.Qg6+ Kh8 16.Ne4!! Qe8! The point is 16...dxe4 17.Qh5+! (not 17.Bh6?? Rg8! 18.Qh5 Nf6 and it's Black who wins) 17...Kg8 18.Bh6! Rf6 [18...Bf6 19.Qg6+ Kh8 20.Ng5 Qe7 21.Bxf8 and 22.Nf7+] 19.Qg4+ Kf7 20. Ng5+ Kg8 (20...Ke8 21.Qh5+ is mate in 2) 21.Nxe6+ winning a queen. 17.Qh6+ Kg8 18.Nfg5 Bxg5 19.Qxg5+ Kh7 20.Qh6+ Kg8 21.Qg5+ Kh7 22.Qh6+ Kg8 23.a4! The rook joins the attack from the a-file - we had already seen a similar idea in the recent Ivanchuk - So game. The path to the victory is too narrow; both sides have to make only moves, but for White it seems to be more difficult than for Black, even though White should be winning. That's what, perhaps, let Riazantsev down eventually. 23...Qe7 24.Ra3 Rf7 25.Nd6! Rg7 26.Rg3 Qf6 27.Rxg7+? This leads 'only' to a big advantage. The winning way was again not obvious at all: 27.Qh5! (just a quiet move, to begin with) 27...cxd4 28. Kd1! (avoiding 28...Qe5+ and leaving the h-rook untouched which makes ...Rxg3 impossible; 28.Ne8 Qe5+ 29.Qxe5 Nxe5 30.Nxg7 Kf7 31.Nh5 is 'just an exchange up in a complicated ending' again) 28...Qe7 (or 28...Nc6 29.Ne8! ; 28...Qe5 29.Qf7+ Kh8 30.Rh3+) 29.Ne8 Rxg3 30.hxg3, etc. 27...Qxg7 28.Qxe6+ Kh7 29.Qh3+ Kg8 30.Qe6+ Kh7 31.O-O Nc6 32.Qh3+ Kg8 33.Qe6+ Kh7 34.Qh3+ (the repetitions by White are a clear sign of the time trouble mentioned by Vocaturo) 34...Kg8 35.Bh6 Qg6. 36.Re1. The computer says that, instead of the natural text move, White should have chosen another way of bringing his remaining rook into the play: 36.dxc5! Nb6 37.Nxc8 Nxc8 38.f4 with f4-f5, Rf3 etc. Of course, it's not obvious even with a lot of time on the clock. In fact, the most practical way is the simple 36.Nxc8 Rxc8 37.Qxd7 Rd8 39.Qh3 Nxd4 40.Re1 with serious advantage, but it seems Riazantsev wanted more than that. 'It was a tough game with a lot of complications... After the result, I was really afraid to ask anything (laughing), but probably it was his strong preparation which he was trying to remember during the game. Maybe after 10.cxd5 and 11.e6 my position was lost'. You will find all those games in full in the viewer (the variations can be replayed in the viewer as well), along with several other selected encounters. For the wider selection of games of the first four rounds, as well as full current standings, schedule, main regulations, and other information on the championship, please don't forget to visit our special page. See also our pictorial report from the championship. Submitted by David Navara on 1 March, 2015 - 08:28. I rather said that my rating WAS too low to qualify for the Grand Prix cycle. Now it might be high enough. Anyway, I have not even come close to qualify. P.S. : I am not going to join the discussion, as I need to focus on the running tournament. 9 rounds are already over in Jerusalem, but it's still extremely difficult to predict the outcome of the European championship, if possible at all. On the top, there is a very close race instead of a clear leader, with the situation changing each round. There are two more rounds to go; they will be separated by the second day-off on March 7th. Having passed its only rest day, the Women's European Championship has entered its final phase. In the eighth round, the games of which were broadcast with a time delay at the request of many of the players, the tournament leader Nino Batsiashvili increased her lead over her closest pursuer to a full point. 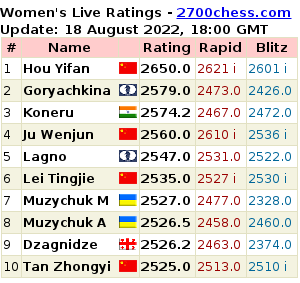 Her win over Olga Girya was the Georgian player's seventh of the event, and she now has 7.5 out of 8. First classical games of the 4th round are over in FIDE Women's knockout taking place in Krasnaya Polyana near the Russian city of Sochi. Humpy Koneru's long winning streak (6 victories in succession) has been finally interrupted by Mariya Muzychuk: the rating favorite underestimated White's attacking resources and missed a beautiful combination. Apart from two crushing wins by female GMs over their stronger opponents, the 3rd round of the Gibraltar Masters saw at least one more encounter worth mentioning. Indian GM Pentala Harikrishna made use of Ioan-Christian Chirila's mistakes in a topical line of the Ruy Lopez and became one of the leaders with 3/3.